September 27, 2013 Geren W. Mortensen, Jr.
Today is the first day of my "staycation" that has allowed me time (and energy) for any photography, short of documenting the new garage door that was installed yesterday. I spent Wednesday "making way" for the installers to work, and yesterday cleaning up the garage afterwards. This morning we dropped Donna's car off at the shop, and on my way back to the house, I decided to try to take some pictures with the Fujifilm X10. It's the start of autumn and the colors are starting to turn, and I want to try to catch some of the "show" this year -- fall colors is a subject I rarely shoot. Of course, the sky is a sullen overcast here in central Maryland this morning, but after my previous missed opportunity, I decided that instead of grumbling and driving on, I'd stop no matter what and make the photograph I've been wanting to try for the past week or so. The subject is a barn on Westminster Pike, just east of Westminster, Maryland. I planned to shoot the back of the barn, which is easily accessible from Rte 140. I had in my mind that he best angle on the barn would be from the northwest corner, so I stopped and made the shot. While it's not a horrible picture, there are certainly some issues that spoil the mood. The biggest is the mid-sixties brick rancher just to the left of the barn. Short of a trespassing romp across the field, there's no hiding that! And, there are some other distractions spoiling the scene. I decided to not bother spending a lot of time on the image, either shooting or in post processing -- though I did decide to see what selectively pushing the color up would do. Last weekend, Donna and I discussed the shot while on our way to the Maryland Renaissance Festival, and she said that she thought the better shot would be from the northeast. So, I moved down the road a bit and got into position. Donna was right. Much better. There are still some serious distractions (houses to the left and the right), but nothing that a little bit of cropping or recomposing couldn't cure. Still, I thought I'd go ahead and work the image up in Lightroom to get a handle on color adjustments and trying to pull a little interest out of the sky. The next version produced a very nice, if predictable, quintessential picture-postcard view of rural Maryland. I rather like this picture, except for the sky. 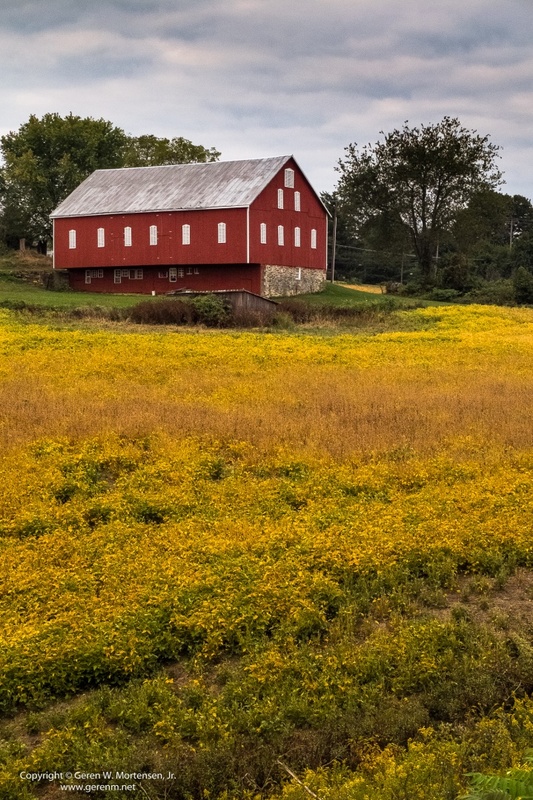 I think this particular crop calls for a pretty, blue sky -- that red barn will really pop on a nice day! But, I was convinced that something could be done with today's sky, too. Fall colors often benefit from overcast, and I wanted to take advantage of what was in front of me. So, what about shooting a vertical? There's interest in the sky (possibly more than a "pretty day" sky). This is the more interesting side of the barn. The subject is obvious and the composition is simple. There are very few distracting elements. The colors are well captured. So, the point of all this: Just because it's not the "perfect day" to shoot, shoot anyway. Don't move past something just because the conditions are not what you wanted when you walked out the door. Stop. Work the scene. Make your picture. I think you'll be glad you did!